The Alcatraz East Crime Museum is a fascinating museum in Pigeon Forge that recently debuted their brand new exhibit, It Happened Here. This temporary exhibit brings together objects from the museum’s collections to reveal crime stories that happened right here in Tennessee! The following is everything you need to know about seeing this new exhibit at the Alcatraz East Crime Museum. The It Happened Here exhibit at the Alcatraz East Crime Museum features a collection of artifacts to tell the stories of Tennessee’s early days when the law was often a gray area for moonshiners, vigilantes and even state officials. Some of the highlights from the collection include the work of local forensics pioneers Dr. William M. Bass and Arthur M. Bohanan, as well as Tennessee’s electric chair known as “Old Smokey.” The It Happened Here exhibit coincides with the 50th anniversary of Dr. Martin Luther King Jr. in Memphis, so there will also be items on display that belonged to assassin James Earl Ray and related to the Brushy Mountain State Penitentiary where he was held captive. Other items of interest include those associated with crime stories local to Sevier County, including legendary lawman Buford Pusser, labor leader Jimmy Hoffa, and a little known Knoxville native named Kenneth Jones who was an inmate at Alcatraz Penitentiary. The It Happened Here exhibit is currently open at the Alcatraz East Crime Museum and runs until May of 2019. The museum is open daily from 10 a.m. to 9 p.m. on Sunday through Thursday, and 10 a.m. to 10 p.m. on Friday and Saturday. Please note that the last ticket is sold 60 minutes prior to the closing time. There are a variety of ticket plans at the Alcatraz East Crime Museum, including reduced admission for seniors, children, Sevier County residents and members of the law and military. You can also purchase admission with an audio tour that complements your visit through the history of American crime with fun facts, songs and exclusive gallery insights! The Alcatraz East Crime Museum is conveniently located at The Island in Pigeon Forge, where there is plenty of free parking available. The museum features American history from a different perspective among 5 unique galleries that dig deep into criminal profiles, victim’s stories, the penal system and forensic science. The museum is 25,000 square feet and spread over 2 floors with more than 100 interactive exhibits! Stay near the Alcatraz East Crime Museum with a vacation at Auntie Belham’s Cabin Rentals! 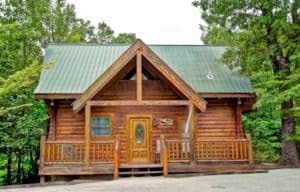 Our cabins are situated among the beautiful surroundings of the Great Smoky Mountains and are just minutes from all of the attractions, shops and restaurants of Pigeon Forge. While staying in our cabins, take advantage of all types of fantastic amenities including fully equipped kitchens, hot tubs, game rooms and much more! Check out all of our cabins in the Smoky Mountains today to plan your vacation near the Alcatraz East Crime Museum! We hope to see you soon at Auntie Belham’s Cabin Rentals!